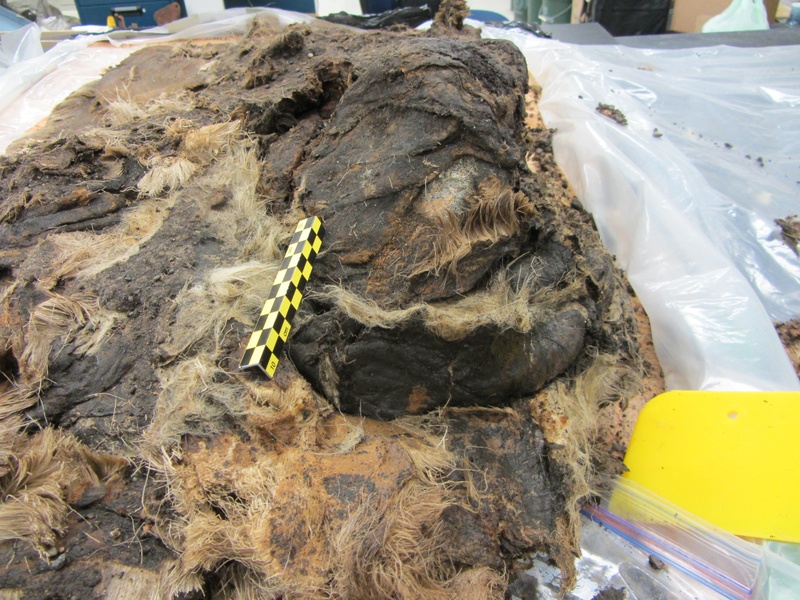 If you remember, last summer we excavated a burial which had some well-reserved fur and hide, including a parka. We put in a freezer (thanks to NSB Wildlife Department and Cyd Hanns in particular), and late last week we brought it to the lab. It took a bit longer to thaw than I thought, so we were only able to start today. Some of the folks I’d hoped could look at the skin sewing since the furs aren’t in great shape and some of the sinew thread (ivalu) has dissolved are out-of-town for the Alaska Federation of Natives (AFN) Annual Meeting and related event, but Shawn is here, and it wouldn’t be right to keep the person around just to study. So I set up a video camera, and am using two other cameras, one with a macro lens to record stitching and so forth, and another for overall shots. Plus I’m taking a lot of samples, and notes as well. The bundle of furs before we started. I got started, with a bit of help from Shawn. He still had one other person to deal with, so I went on without him for a bit. Qaiyaan Harcharek, and Lottie Jones, from the Inupiat History, Language and Culture Commission staff came by. Lottie had to get back to the office, but Qaiyaan, who has a degree in Anthropology, came back and we worked on the person until after 5:30. 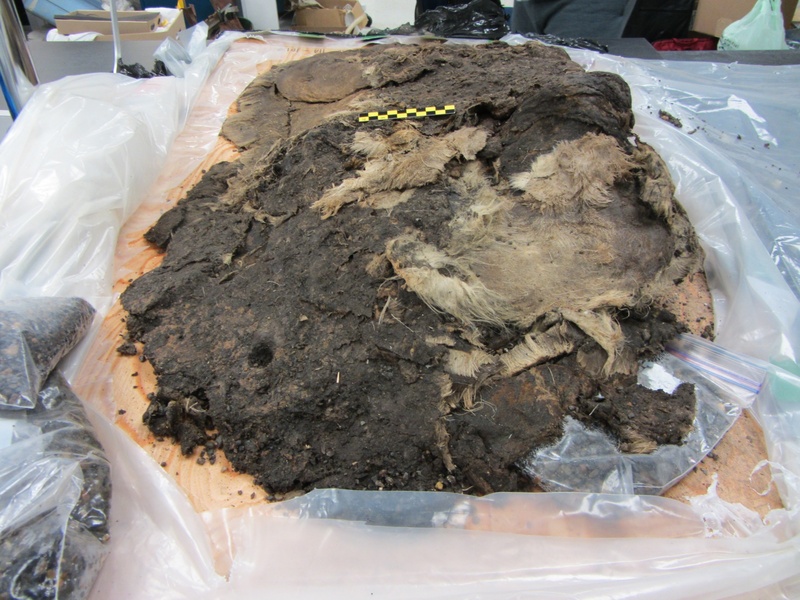 The first bit of the caribou hide wrapping unfolded at lower left. 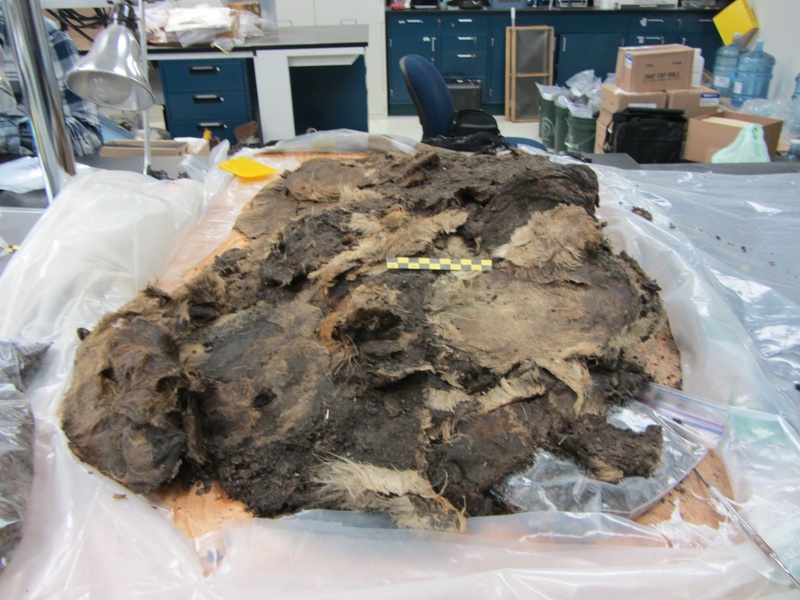 What we were able to figure out so far is that the person was laid on a caribou hide, so of which was wrapped up around the lower legs and over the left side. It’s possible that it may also have been over the right side and decayed so badly it wasn’t recoverable. I’ve got to go back and look at the pictures and notes from the excavation. Once we got part of the hide unwrapped, it was clear there was another kind of hair present. Caribou have long, fairly straight hollow hairs that don’t taper very much. There was a lot of much finer, tapering hair, which had matted down. We were discussing what this might be, and had guessed at maybe wolf when Qaiyaan and Lottie had to head back to town. Further unfolded, with what turns out to be wolf beside the photo scale. I kept unfolding layers of furry hide, and all of a sudden, there were long dark guard hairs showing. One more fold, and there was a very well-preserved patch of what is obviously wolf (if you’ve seen wolf skins, anyway). It actually feels very much like my wolf ruff, which was probably running around 5 years ago, even though this one must have been dead for hundreds of years. We don’t have a date yet, but wolf should be good for dating. So that mystery was solved. Shawn was able to look at the remains of the cranium, which had not been as well-preserved, and the person seems to be a child of 4-6 years or so. We all have kids, and it made us sad to think how this child’s parents must have felt. We still don’t know what the wolf was. It has stitching, but it seems to just be wrapped around the legs. The child is wearing what appear to be skin-in caribou boots, which may actually go all the way to the waist, sort of like hip-waders. The wolf doesn’t seem to be over-pants, especially as the hair side is in. Maybe we can figure that out tomorrow. Posted on October 17, 2011 by Anne JensenPosted in Archaeology, lab, NuvukTagged Archaeology, Barrow, burial, lab, Nuvuk, physical anthropology. So interesting to imagine what has happened so long ago – and amazing to think that you and your associates may be able to reveal it. I am still awed that I was allowed to see this in the lab. I have turned it over and over in my mind. I really want to see a close-up of the stitching. I saw many small children wearing one piece socks-pants, years ago. I really like your blog. Archaeology seems like it is very interesting. I really like finding out about old cultures. Thank you for posting and keep up the good work.